No. 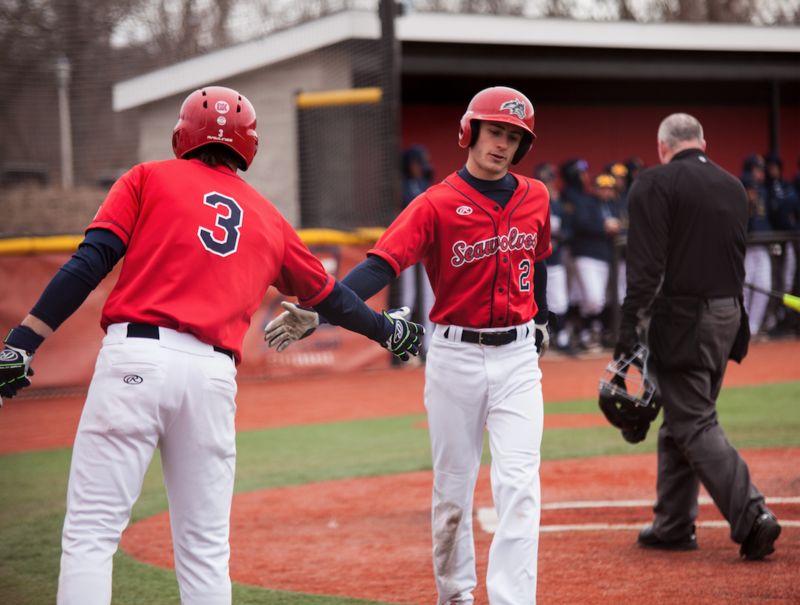 2 Stony Brook Baseball closed out its home schedule with a series win against the No. 1 Hartford Hawks, splitting a double header on Saturday before winning the rubber game on Sunday. The Seawolves got off to a good start Saturday afternoon against the conference’s top team with an 8-5 victory. Stony Brook senior infielder Bobby Honeyman put his team up early with a triple down the right field line, scoring senior outfielder Andruw Gazzola. Sophomore infielder Nick Grande doubled the home team’s advantage in the third inning with a solo shot over the left field wall, advancing the lead to 2-0. Hartford senior outfielder Nick Campana responded in the top of the fourth with a home run of his own, but Stony Brook freshman catcher John Tuccillo’s sacrifice fly in the bottom of the inning regained the two-run advantage. The Hawks were able to push back in the fifth for a 3-3 tie, but five Seawolves runs over the innings to follow gave the team a cushion too large to surrender. Hartford attempted a last-ditch comeback in the ninth inning and scored two runs, putting pressure on the Stony Brook defense, but redshirt-sophomore pitcher Aaron Glickstein was able to fend off the Hartford push to secure the game-one win. Hartford showed why they possess the America East’s top record in the second half of Saturday’s double header, responding with a 7-0 win to tie the series at 1-1. Freshman outfielder John Thrasher led the way offensively for the Hawks, recording a team-high two hits and two RBI. Thrasher factored in on each of Hartford’s final four runs in the game, which was called after seven innings. The Seawolves used five pitchers in the loss, with three sharing the mound in the top of the seventh alone. The Hawks on the contrary, didn’t go to their bullpen once, with freshman pitcher Nicholas Dombkowski staying in for all seven innings to earn his sixth win of the season. Stony Brook’s start to Sunday’s game three was similar to the first’s of the series, opening the scoring in the bottom of the first inning. Honeyman gave the Seawolves a 1-0 lead with his RBI single to center field, scoring Grande. The scoreboard remained that way until the top of the fourth inning, when sophomore infielder Jackson Olson brought junior outfielder Ashton Bardzell home with a single up the middle. The score remained knotted up at 1-1 over the next three-and-a-half innings, until junior infielder Brandon Janofsky’s sacrifice bunt sent Tuccillo home to take a 2-1 lead. Stony Brook appeared in position to close out the game in the top of the ninth with two outs and junior infielder Chris Sullivan on second, but a pair of wild pitches past Tuccillo brought the runner to third and then across home plate for a 2-2 tie going into the bottom of the ninth. Despite the disappointing turn of events, the Seawolves remained optimistic. Tuccillo came up to the plate with sophomore outfielder Michael Wilson on second and no outs. After allowing the Hawks to tie it up, Tuccillo was hungry to make up for it. Tuccillo closed out the game, and the series, with a walk-off single, scoring Wilson and securing his eighth multi-hit game of the campaign. He earned Co-Rookie of the Week honors for his efforts along with Dombkowski. Stony Brook will conclude its regular season schedule on Friday, May 18 and Saturday, May 19 with a series of games against third-ranked UMass Lowell at Lelacheur Park.